In the summer of 1986, after the classes and hostels of the Sree Kerala Varma College in Thrissur had emptied for the holidays, there was an announcement by the college management that got my friends agitated. The principal had given a statement to the local newspaper that the college would be cutting some trees to build a compound wall. The SKV College has a history. The campus was once a palace for the Kochi royalty, which was later donated for the college. The trees that the management had wanted to cut for the wall were old-growth ones that were part of the sacred grove inside the palace. The trees were part of the college's and the neighbourhood's history. In our youthful idealism, a few of us students did not want the trees to be cut. We protested and lost, but in the process I heard the name of N. D. Jayal (NDJ) for the first time. A few days into the campaign, I wrote a letter to Sunderlal Bahuguna. We had heard of him and the Chipko Movement. Bahuguna responded quickly, telling us of the importance of old-growth native trees. A day later, I also received a letter from the Indian National Trust for Art and Cultural Heritage (INTACH), signed by NDJ, supporting our action. We photocopied the two letters and dropped them in the local offices of Malayalam and English newspapers. Suddenly, from a bunch of impertinent boys protesting against the wisdom of the college management to construct a compound wall, we became, in the eyes of local reporters, a group of environmentally conscious students fighting David-like to conserve old growth trees from the might of the college management. Sunderlal Bahuguna was well known with journalists, and for INTACH the fact that Prime Minister Rajiv Gandhi’s name appeared as a patron on the official letterhead helped. “Prime Minister supports students’ struggle against tree felling” ran one of the headlines in a local Malayalam newspaper. Neither the journalists, nor I knew the importance of the man – NDJ – who had signed the letter, and the role he had played with quiet determination over years to protect India’s environment. I was to understand that, first hand, a few years later. N.D.Jayal in his garden chair. 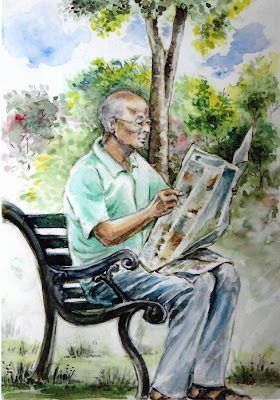 A water colour by Indira Ramesh. I met NDJ for the first time five years later in his INTACH office. He had an office with multiple glass windows that stuck out onto the lawns of 71, Lodhi Estate. This was before the old colonial bungalow was brought down for the present building. I had worked for three years in the communication department of a national-level NGO, Action for Food Production, and was looking for some action. I met NDJ in his book-lined office. Indira Ramesh, who was to become my boss and mentor, took me to his room and I was hired to work with them during that very meeting. I wanted action and got much of it in the two years that I worked with the Natural Heritage Wing of INTACH. I was in my mid-20s and was awestruck to have been pushed into the vortex of the anti-Tehri dam movement. We were also supporting the anti-Narmada dam movement. We had an active publication programme, where we published environment books, booklets and a newsletter. From the time I met NDJ in his office in 1990, I was always impressed by the gentleness with which he spoke. But he never pulled his punches. Perhaps it was a combination of his inherent nature and decades of experience in the bureaucracy, NDJ always argued his case softly, without ruffling feathers through a harsh note or a thoughtless word. The mild exterior, however, always packaged strong arguments ruthlessly delivered for impact. He was a gentle tiger. NDJ had moved to INTACH after his retirement from government service. Despite decades of rich experience he was never overbearing towards us young people in his team. However, he was not kind towards ignorant arrogance. At a lunch, I heard one of our friends, also in his 20s, tell NDJ that there was no administration in Arunachal Pradesh. The friend used to work in the next-door office of the World Wide Fund and had come to the rather momentous conclusion after a quick tour of Arunachal Pradesh that lasted a few days. Perhaps he did not know that as a civil servant NDJ had helped establishing the administrative structure in the north-eastern state. I heard NDJ clearing his throat. Gentle bloodshed followed. When I was part of NDJ's team. 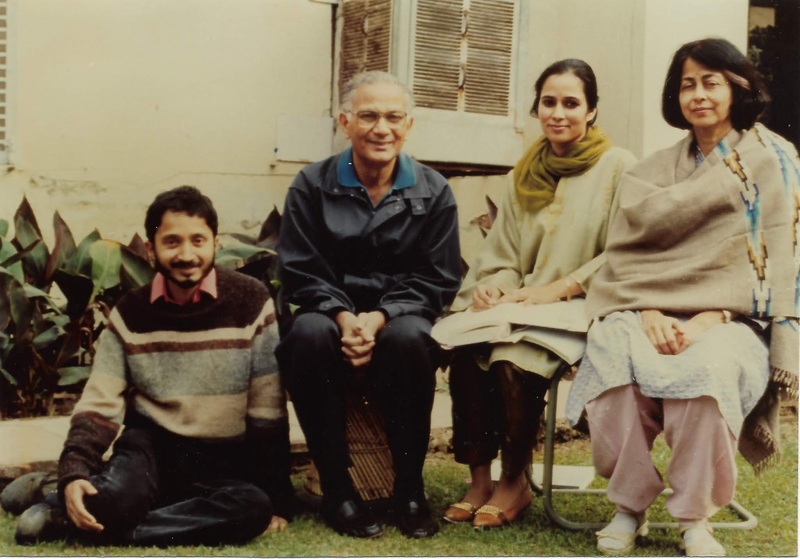 Indira Ramesh is at extreme right. Since I was a general dogsbody in INTACH, I used to coordinate media relations. The Tehri dam controversy that had gone silent erupted again after the Uttarkashi earthquake of October 1991. NDJ called for a press conference to bring back into the conversation the dangers of constructing a 240-metre tall dam in the Himalayas, which was prone to earthquakes. Due to the topicality of the subject, more journalists assembled than expected. While some were veterans who had covered the issue in the past, many were newbies who asked questions that took the discussions back to scratch. NDJ answered them patiently, and did not digress from his arguments even while facing provocative questions. Of essence for NDJ was an argument built on facts rather than rhetoric. He had commissioned economist Vijay Paranjpye to carry out traditional cost-benefit analyses of the Sardar Sarovar Dam and the Tehri Dam projects. Both his studies were published as books by INTACH, and they detailed how the costs of both the projects were higher than the benefits that were to accrue from these projects. Using conventional cost-benefit analysis methods, Paranjpye argued that the benefits were shown to be higher by the project proponents because they had externalised the social and environmental costs. The government did not accept the findings of the INTACH studies. But it never refuted them either. By commissioning and publishing these studies, NDJ took the anti-dam argument from the rhetorical “say no to dams” one to one based on hard facts. Similarly, his arguments protesting the construction of a high structure such as the Tehri Dam in the Himalayas, which has the probability of being struck by an 8-plus magnitude earthquake, was based on the opinion of well-known geologists. These arguments were also the basis for the petition he filed in the Supreme Court, along with Shekar Singh in 1991, against the Tehri Dam. During that period the Natural Heritage Wing of INTACH also commissioned the publication of a book on the biodiversity of the southern Western Ghats, written by a well-known ecologist from Kerala, Sathis Chandran Nair. NDJ’s friendship with Nair started during the days of the Silent Valley controversy. Nair, who had extensively trekked the southern Western Ghats region had collected persuasive data that proved that there was reason to conserve the Silent Valley and prevent it from being destroyed by a hydro-electric dam. NDJ, who then had an important official position in the national government helped communicate Nair’s message to the policy makers. Nair’s The southern Western Ghats: A biodiversity conservation plan, published by INTACH in 1991 was a first of its kind assessment of the importance of the biological diversity of the Western Ghats south of central Karnataka to the Agasthyamalai Range near the tip of the peninsula and the need for its conservation. In the same period, INTACH also published a book by Ganesh and Vasudha Pangare. While the rest of the country had not realised the significance of the transition that a retired army driver – Anna Hazare – had made to the conservation of natural resources of his village Ralegan Siddhi, Pangare’s book documented it for the world. I had missed working on the Parajnpye manuscripts, but was assisting Indira Ramesh with the editing and publication of Nair’s and Pangares’ books. 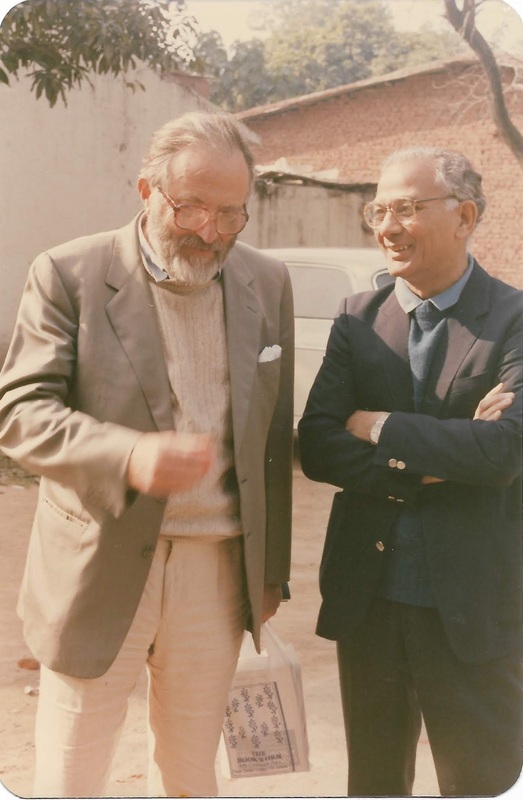 NDJ with Edward Goldsmith, editor of the Ecologist, when he had visited New Delhi in 1991-92. In 1990-91 NDJ and Indira had thought of starting a monthly newsletter that would connect all the activists and kindred souls supporting the anti-dam movement. I was assigned to make this happen. We gathered in NDJ’s multi-windowed office to decide on the name for the newsletter. We had by then decided its periodicity – once a month. The main purpose of the newsletter was to focus on the Tehri Dam project, which was to bridle Bhagirathi and Bhilangana rivers at the point where they meet. We called our newsletter Bhagirathi ki pukar (Bhagirathi’s call). After the Uttarkashi earthquake in 1991, NDJ asked me go to Tehri to see first hand its impact. The aftershocks were still continuing. Soldiers and Garhwali men were returning to their villages from their employment posts in different parts of the country, to see what was lost and to pick up from where the earthquake had left their lives. In villages, there were men and children with shaved heads – having carried out the last rights of the dear ones they had lost. Sunderlal Bahuguna was on a sit-in strike at the site where the Tehri Dam came later. The killer earthquake, of course, was no warning to those in power. The dam did come, and the tall column of water continues to hold out its threat from the mountains. I travelled to Silyara, where Vimala Bahuguna, Sunderlal’s wife and herself a leader of the Chipko movement, made us as comfortable as she could under the circumstances. Simple lives lived with stoic dignity. My window to NDJ’s professional life was of a mere two-year span. It was looking and understanding a man of his experience and achievement through a keyhole. However, I continued on the path that I had set out on when I worked with NDJ. I continued being an environment journalist and communicator. It was difficult times when I was adventuring into environment journalism in the late 1980s and 1990s. Economic liberalisation had just been launched in 1991, and media houses were competing with each other to sing hosannas to the epochal change that would unleash the growth that India deserved and was earlier being smothered under a Hindu rate of growth. To be an environment journalist in those days was to assign myself to professional masochism, where everybody around me happily called me an “obstructionist”. I persisted with the quiet determination that NDJ had taught me. As I went about my job of understanding and reporting India’s modern environment history, I felt that somewhere NDJ did not get the mention that he should have got for his contributions. For years he was Prime Minister Indira Gandhi’s pointsman on environment. Many others who held the same position in different parts of Indira Gandhi’s tenure had gone on to become famous. This list included Manmohan Malhoutra, M.K. Ranjitsinh, Samar Singh and R. Rajamani. History had not given its due to NDJ. The only exception, and that too in 2017, was former environment minister Jairam Ramesh’s environmental biography of Indira Gandhi (Indira Gandhi: A life in nature. By Jairam Ramesh. Simon and Schuster, 2017). Ramesh wrote that Jayal played an active role in the N.D. Tiwari Committee that was tasked with recommending legislative measures and administrative machinery for ensuring environmental protection. The recommendations of the committee led to the establishment of the Department of Environment in 1980, which later went on to become a full-fledged environment ministry. Gandhi entrusted Jayal with missions that involved travelling to states and studying and recommending corrective action on the environment – Bharatpur in Rajasthan, Satkosia Gorge in Odisha, and Mahabaleswar-Panchagani in Maharashtra. In 1982 Gandhi sent him to study the UK National Trust, an idea that later developed into the Indian National Trust for Art and Cultural Heritage (INTACH). However, as Indira Ramesh’s chapter elaborates, when NDJ retired from the government, he had ended only one part of his achievement-filled life. There were far more achievements that followed. The cover of the recently published book on NDJ. My blog is a chapter in this book. In August 2015, I met NDJ at his home in Dehradun. He was on his reclining chair in his room with books and filing cabinets spreading across the walls. He asked me if I could think of a public institution that would be interested in archiving for public and posterity the environmental papers that he had collected over the years. Why not the Nehru Memorial Museum and Library (NMML)? His question had to hibernate the night for me to think of this answer. NDJ found the idea good. I wrote an exploratory email to the then director of NMML, an environment historian of repute. Within five minutes I got a response. He was interested, and had also marked the official concerned in his email. Those papers had a different destiny though. The director resigned the next day, due to differences with the national government. I am given to understand that NDJ’s papers have later made their way to a university where future generation of researchers and students will have access to them. The NMML director had moved to this university and ensured this transfer. For NDJ, the priority was always to give back to the society from which he had drawn. It was with this spirit that he trained me in 1990-92. He also taught me another important life lesson – I didn’t need to have a gruff voice to roar. [I wrote this as a chapter in a recently-published book on NDJ, who turned 92 in February. The book was published by the Doon Library and Research Centre in Dehradun]. I have heard a lot about N D Jayal, about his firm and unwavering committment to conservation. Thank you for writing this.